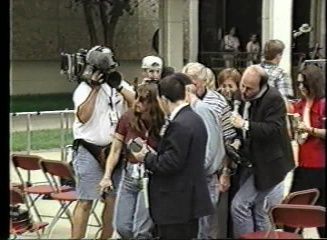 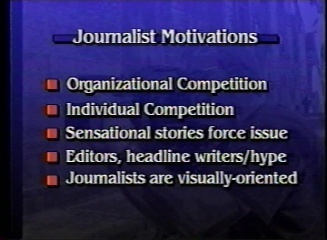 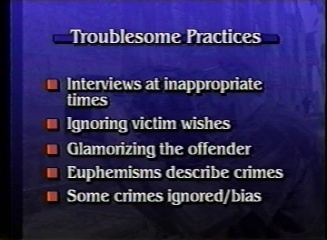 The News Media's Coverage of Crime and Victimization (1999) explores how the news media cover crime victims and what can be done to help crime victims cope with the oftentimes insensitive coverage of tragic events. 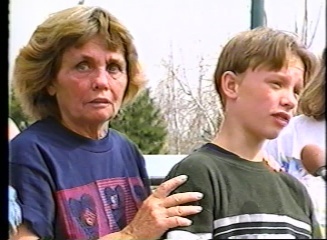 Some example events illustrated in this film include the 1986 murder of Jennifer Levin, the 1995 bombing of the Alfred P. Murrah Federal Building in Oklahoma City and the 1999 shooting at Columbine High School in Littleton, Colorado. 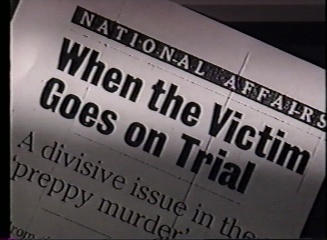 The main focus of the film is to show a better way to handle these tense and emotional situations.